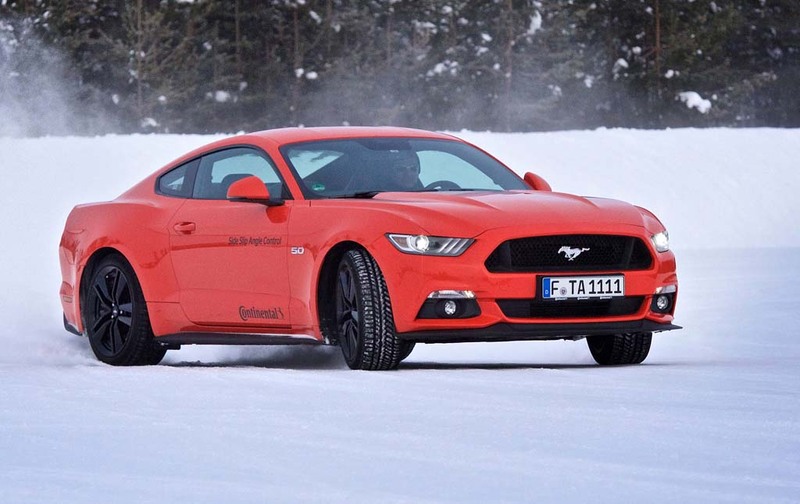 Having fun with a 5.0 litre V8 Mustang on the frozen lake. Continental are one of the biggest names in the tyre business but that’s not all they do. It’s hard to name a single car on the market that doesn’t have some component supplied by this huge company. Regularly, they invite us up to the frozen North to try their latest tyres but this year, we’d also get a chance to test some of their active safety systems. Our trip began in a classroom, about half way up Sweden. For a thoroughly fascinating afternoon, the boffins explained their latest breakthroughs, including intelligent tyres and wheels capable of altering rim width and pressure to adapt to prevailing conditions. Intelligent tyres are three to five years away. Already, we have tyres with embedded pressure sensors which pass their data to the car over a radio link. These prototypes are conductive and the data passes through the tyre itself. 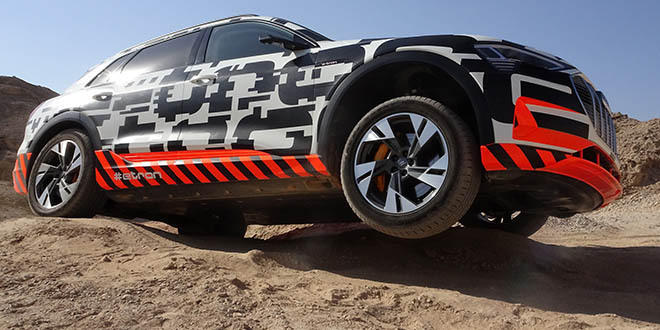 They are also able to instantly detect a puncture and can measure temperature, pressure, tread depth and ultimately the contact patch with the road. Probably a more fanciful concept is the adaptable wheel, which uses hydraulics to restrict and expand the rim width. The wheel can also alter the tyre pressure while running so you can have a narrow rim with high pressure for low resistance at high speed but switch to a wider wheel with low pressure to provide more grip on snow or mud. Fascinating stuff but I’d say we’ll be waiting a while before we see this tech on a production car. The following day, we flew North to just under the Arctic Circle to Continental’s own proving grounds. Look ma… No hands! Being autonomously driven around an ice track in the frozen north. Our first task was to trial the latest high performance winter tyre, the TS 860, in an Audi S4 Avant, BMW 440i and a front wheel drive Mini. The improved performance comes mainly from changes to the compound and the tyres proved to be incredibly grippy even on deeply packed snow. Even with the best tyres though, it’s easy to overcook things and I have to admit that I arrived at one hairpin a shade too fast and gently touched off a snowbank. Happily, nothing was injured but my pride. Next we had the chance to try ABS3, the latest ABS module which is already in the Volvo XC90 and the Honda Civic. We compared it to its predecessor, ABS2, by applying maximum braking at 70km/h on a chequered pattern of alternating ice and tarmac, the ultimate test for ABS. While both modules performed well, there was a clear step up in performance with the latest system, which can react in as little as five milliseconds. It was more stable and ultimately stopped the car more quickly. That said, on one of the runs, my colleague hit the brakes with the car slightly off centre and we ended up broadside. Even with the best electronics, the driver can make a mistake. Following this, we got into a 5.0 litre V8 Mustang, fitted with a prototype stability system which would allow the back of the car to slip by six degrees and no more. Half way through a slalom course, the engineer beside me switched the system off and I was left with standard stability control. Instantly, the car was much harder to control. It was an emphatic demonstration. With the system still off, I had a bit of fun on the way back up the lake, taking advantage of the Mustang’s correct wheel drive to keep the car sideways for as long as possible. I tried to keep the engineer distracted by asking how the system worked but I’m sure he still noticed. To operate properly, this new system depends on the presence of a roll sensor so we won’t be seeing it in a production car for a few years. Finally, we had two automated driving demos. Continental have developed a system which uses an ordinary camera to detect what type of surface the car is driving on. For an autonomous car, this is rather important data and this device was eerily accurate and very quick. From there, we were autonomously driven at a decent speed around an ice track with solid looking snow banks on either side. I never expected my first real experience of a self-driving car to be on snow. Continental’s Vision Zero mission statement puts forward a world where there are zero accidents or fatalities on our roads. Getting to that goal depends partly on the technology and automation we experienced at minus 20 degrees.